Margaret Sackville was an aristocratic English writer who wrote poetry, novels and plays for both adults and children. Her output was considerable with over 40 titles to her name. At the beginning of the First World War she was active in the peace movement, joining the Union of Democratic Control to voice her opposition to the war. She was born Lady Margaret Sackville on Christmas Eve, 1881. The family home was in the Mayfair district of London, her father being Reginald Windsor Sackville, the 7th Earl De La Warr. She displayed a talent for writing poetry from a very early age and soon came under the influence of the anti-imperialist poet Wilfrid Scawen Blunt. He encouraged the sixteen years old Lady Margaret to get her poems published in a number of publications including the Pall Mall Gazette, The Nation and The English Review. Her first book came out in 1900, this being a collection of poems called Floral Symphony. She was elected the first president of the Poetry Society on its formation in 1912 and she soon made it known that she hoped that it would be a serious vehicle used to develop new English poets, rather than for flippant, social gatherings. Sadly that is exactly the direction that it went in, perhaps reflecting early 20th century London society. It could have crumbled but, in fact, went on to thrive and is still in existence today, providing a useful forum for new and established writers. Lady Margaret never married throughout her long life but she might have done but for differences in religion. The politician Ramsay MacDonald pleaded with her to become his wife but she refused, for reasons of different social standing as well as the fact that she was a Roman Catholic. The future Labour Prime Minister was a Free Church of Scotland member. The aristocratic Sackville family, like most throughout the country, were not spared from the carnage at the front. The 8th Earl, Lady Margaret’s brother Gilbert Sackville, fell during 1915. No doubt this sharpened her determination to write down her feelings as strongly as she could and there were no patriotic undertones in her writing. After the war she lived mostly in Edinburgh, becoming the first president of the Scottish PEN society. She hosted many literary salons, receiving such luminaries as Henry James and Compton Mackenzie. As well as her poetry she wrote a number of plays including one called A Masque of Edinburgh which depicted the history of the city from Roman times through to the 19th century and this was performed in 1922. Her work aimed at children included Fairy Tales for Old and Young (1909) and The Travelling Companions and Other Stories for Children (1915). She moved to the Gloucestershire spa town of Cheltenham in 1936 and remained there for the rest of her life, ending her days in the Rokeby Nursing Home. 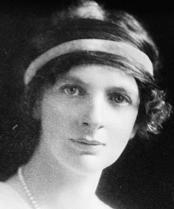 Lady Margaret Sackville died of a heart attack on the 18th April 1963 at the age of 81.